Oh Pinterest, you vixen. Enticing me with indulgent food, outfits I could never put together by myself, cute sleepy puppies, inspirational quotes that I forget 10 minutes later, six-pack abs, and deceptive craft projects that require seven trips to Michael’s. Can I believe you when you tell me that two eggs plus a banana equals pancakes? 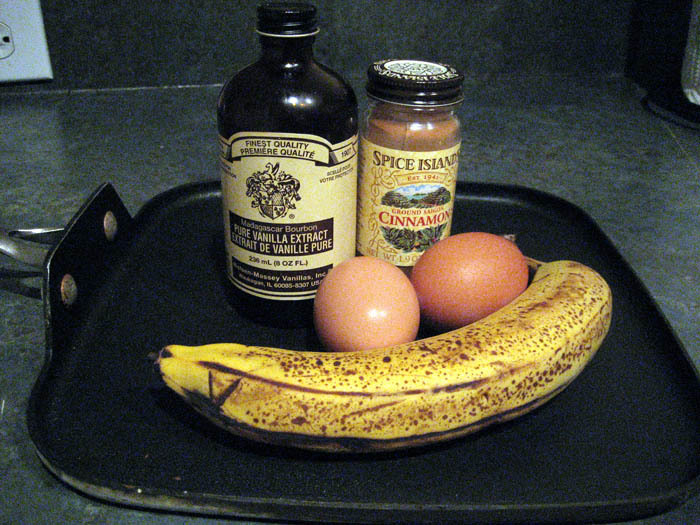 I’d been eyeing this pin for two ingredient Paleo pancakes for awhile. Seriously? But how do they get fluffy? Well… they don’t. They’re very thin, like a crepe. Which is fine in my book. I love crepes (you heard me Ricky Bobby). Do you know what Paleo is? It’s short for the Paleolithic diet, which is based on the foods humans ate during the Paleolithic Era (think cavemen). It focuses on naturally raised proteins, vegetables, fruits and nuts (think hunter-gatherer) and eliminates grains, starches, processed sugars and oils (think all of your favorite foods). The Paleo diet and CrossFit tend to go hand-in-hand, so I’ve become more Paleo curious as of late. Just as I see merits in veganism, I see merits in the Paleo diet as well. 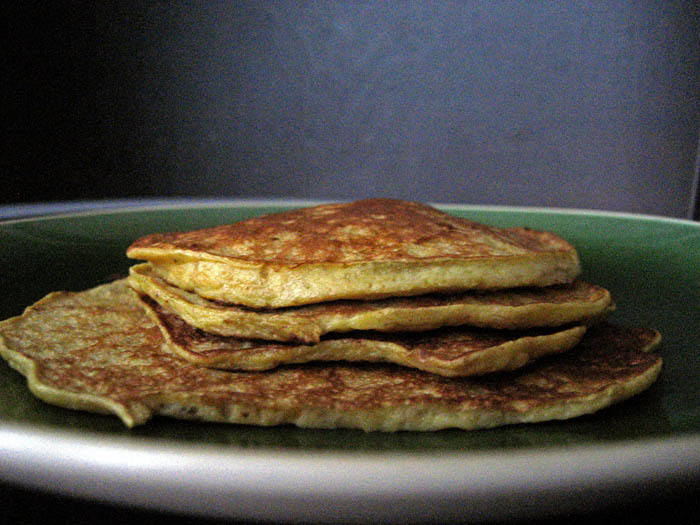 These “pancakes”— being just eggs and a banana — are a perfect Paleo breakfast. And if you think about it really, you’re consuming the same thing if your breakfast was scrambled eggs with a banana on the side except, your mashing it all together and frying it. I was quite surprised with how much I enjoyed these. Duh, they taste like eggs and banana, which sounds weird together, but think of the flavor more like banana french toast that went a bit heavy on the egg batter. No, they are not a replacement for thick and fluffy IHOP pancakes, but they might help you curb a craving. The bonus is you can eat ALL the pancakes this recipe makes in one sitting. 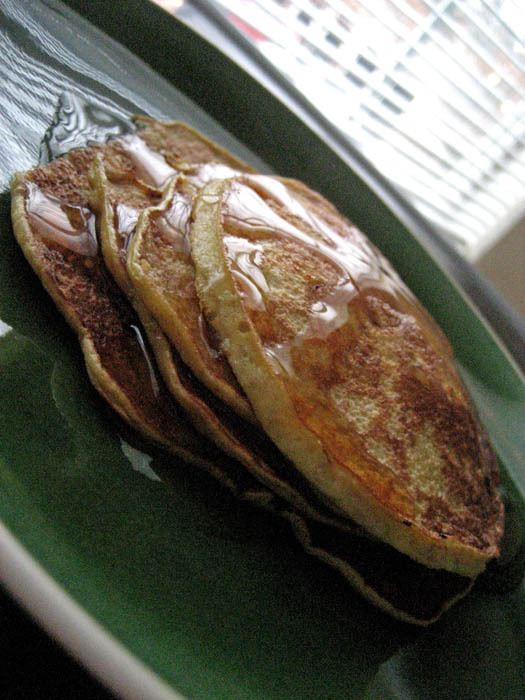 They’re so thin; you can get about six pancakes out of it, but the whole stack is only 261 calories! That said, I have to admit, these didn’t leave me full for long. I needed a snack about two hours later. I will warn you these are not pretty. 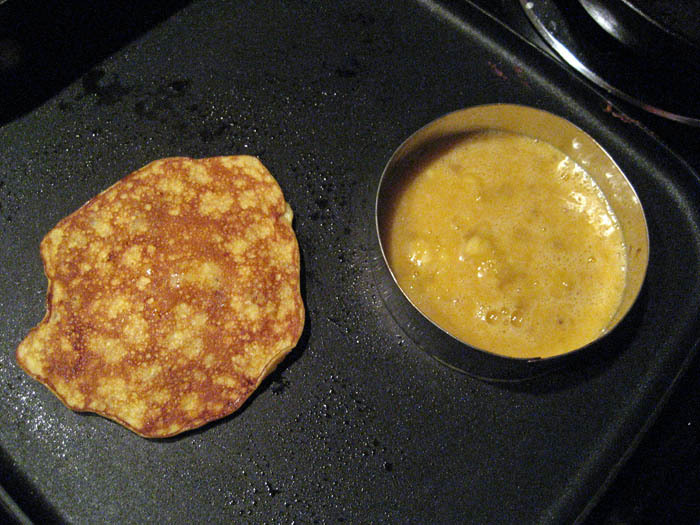 The batter runs all over the place instead of making perfect circles like regular pancake batter. You can remedy this, however, if you have a circular cookie cutter or any kind of pancake mold. When I used the cookie cutter, I had a perfect circle pancake that was even a bit thicker and more pancake like than the others. 1. Heat skillet over medium heat. 2. In a small bowl, smash up a banana with a fork. 3. Add two eggs to the bowl and beat until well incorporated. 4. Add a splash of vanilla, a shake of cinnamon and a pinch of salt (I figured it couldn’t hurt!). 6. Top with syrup or whatever floats your boat. How you like that caveman?